Zion Market Research has published a new report titled “Molecular Breeding Market by Marker (Simple Sequence Repeats (SSR), Single Nucleotide Polymorphism (SNP), and Others), by Process (Marker-Assisted Selection (MAS), QTL Mapping, Genomic Selection, Marker-Assisted Backcrossing (MABC), and Others), and by Application (Livestock and Crop): Global Industry Perspective, Comprehensive Analysis, and Forecast, 2017–2024”. 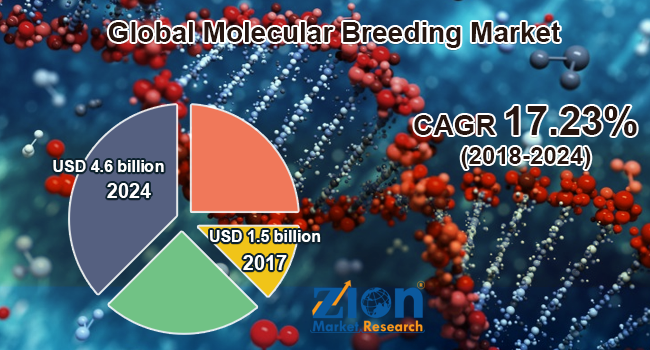 According to the report, the global molecular breeding market was valued at approximately USD 1.5billion in 2017 and is expected to generate revenue of around USD 4.6billion by the end of 2024, growing at a CAGR of around 17.23% between 2018 and 2024. Molecular breeding deals with genetic manipulation in plants and animals at the DNA level. Molecular breeding aims at improving crop yield and reducing disease resistance, biotic and abiotic stress resistance, etc. Breeding process is performed using various gene manipulation techniques, such as marker-assisted selection, genomic selection, QTL mapping, etc., with the help of various molecular markers, such as Simple Sequence Repeats (SSR) and Single Nucleotide Polymorphism (SNP). Molecular markers are selected based on the trait to be improved. Worldwide, the population is growing at a considerable rate and is expected to reach about 8.6 billion by 2030, as per the United Nations. With the population growth, food demand is expected to rise. Crop and livestock yield need to be improved in order to meet the growing food demand in the future. The need to improve crop yield is the major factor driving the growth of the molecular breeding market. Also, crop yield is largely affected by climatic conditions. Biotic and abiotic stress resistant crops can be produced using molecular breeding techniques with improved yield and other traits, which in turn, are predicted to help drive the market growth. Other factors accelerating the molecular breeding market growth include increased government funding for agrogenomic research, technological advancements made in molecular biology, declining prices of genetic and molecular biology research products, and huge investments made in research and development activities by market players considering the market potential of the molecular breeding products. The expansion of the molecular breeding market is likely to be hampered mainly by the need for huge capital investments and the lack of advanced infrastructure in developing economies. Growing demand for industrial crops, such as wheat and corn, might act as an opportunity for the expansion of the molecular breeding market. The global molecular breeding market is divided based on the marker, process, and application. The marker segment is categorized into Simple Sequence Repeats (SSR), Single Nucleotide Polymorphism (SNP), and others. The others segment includes a sequence tagged site, Expressed Sequence Tags (EST), and Random Amplified Polymorphic DNA (RAPD). Based on the breeding process, this market is segmented into a marker-assisted selection (MAS), QTL mapping, genomic selection, Marker-Assisted Backcrossing (MABC), and others. The others segment includes position gene cloning, Marker-Assisted Recurrent Selection (MARS), and genetic fingerprinting. The molecular breeding market has applications in crop and livestock. The crop segment holds the maximum share of the application segment, whereas the livestock segment is projected to grow significantly in the upcoming years. The crop segment is further classified into oilseeds & pulses, cereals & grains, vegetables, and other crops. Cattle, poultry, and others are the sub-segments of the livestock application segment. The global molecular breeding market is segmented into Europe, North America, Asia Pacific, the Middle East and Africa, andLatin America based on region. The largest regional market for molecular breeding was North America in 2017 and is expected to hold the leading position in the forecast time period. Government fund for the agrogenomic rise in the R&D activities, advanced technology, and well-developed infrastructure are the key factors promoting the growth of the market in this region. Europe was the second largest market in 2017 and is likely to maintain its position during the forecast time period. The Asia Pacific is a rapidly growing region for this market, owing to increasing R&Dinvestments made by government-owned research institutes. Considerable expansion of the molecular breeding market is likely across the Middle Eastern and African region in the upcoming years. Moderate growth is expected in the Latin American region during the forecast time period. Some key players operating in the molecular breeding market include Illumina, Eurofins, LGC Limited, SGS, Thermo Fisher Scientific, Intertek Group, DanBred, LemnaTec, Slipstream Automation, Charles River, and FruitBreedomics, among others.